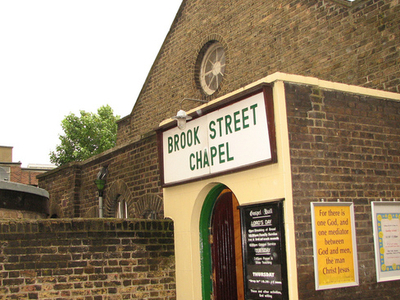 Brook Street Chapel is a nondenominational church building in Tottenham, North London. The building was constructed for use as a meeting place for local Christians affiliated with the Plymouth Brethren movement. A group of around eight individuals who had seceded from the Quakers met in the house of a Mrs Sands in Stoney South (now Stoneleigh Road) from 1838, and the Brooks Street Meeting House was constructed and opened in 1839. Prominent amongst the original members were the chemist John Eliot Howard and his brother Robert, and some funding was also provided by their father, the meteorologist Luke Howard, who moved to Tottenham shortly after. The Howards are commemorated in Tottenham by a blue plaque to Luke at 7, Bruce Grove, and a green plaque to John on the site of his home, Lord's Meade (now Lordship Lane). Here's the our members favorite photos of "Churches in London". Upload your photo of Brook Street Chapel! Emiliya Petrova is the only Touristlink member to visit Brook Street Chapel. Have you been here? Click here to save it.